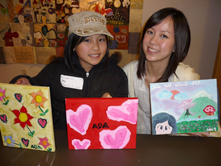 The Big Sisters of BC Lower Mainland visited ArtStarts this weekend to participate in their first ever Art Crawl. Participants had tours of both the Contemporary Art Gallery and ArtStarts, where they checked out the Creative Connections exhibition. After the tours everyone let their inner artists out with a painting activity. The group had a great time and we hope we'll see them again next year!